To protect the residual limb from any inadvertent trauma, i.e. a fall or a collision, and avoid any delays in healing. The PSRD may also help control swelling, teach donning, volume management and facilitate handling. 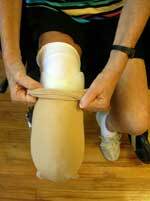 Any wound dressings should be kept to minimum thickness to avoid introducing a pressure point in the socket. Dressings should be designed to keep any open areas clean, and absorb drainage before it would soil the stump sock. Dressings do not provide padding. The PSRD is worn over a stump sock and can also be worn over a stump shrinker socks or ace wraps as indicated. Stump Shrinkers may be worn with the PSRD as shown here. Carefully don a single white 2-ply sock. Make sure the smooth side faces in and do not over stretch the material. The sock is designed to cushion and should maintain full thickness. PSRD is split posteriorly to self adjust for changing stump volume or dressing thickness. The socket shape is custom designed to selectively apply pressure and avoid irritations. 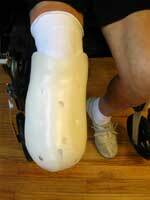 If excessive changes in either stump size or dressing thickness occurs the socket can usually be modified by the prosthetist to accommodate. Apply the Compresso-Grip outer sock. The Compresso-Grip outer sock should lightly compress the socket and prevent it from rotating on the stump. The posterior socket is designed to overlap as the fit loosens. The Compresso-Grip outer sock should be pulled high on to the thigh to prevent it form slipping down. It’s important to avoid the top edge from rolling down. Unless otherwise specified, the Polyethylene Semi-Rigid Removable Dressing should be worn when the patient is up and about. Wearing time can be extended to full time for greater edema control or if there is further risk of injury while in bed. The PSRD should be cleaned regularly. The plastic socket can tolerate soap and water, as well as any alcohol-based disinfectant or cleaner. Any cleaning residue should be rinsed off completely and dried with a clean cloth. Clean socks should always be worn. Contact our office if additional socks, shrinkers or outer Compresso-Grips are needed. The stump should be inspected regularly for any irritation caused by the PSRD. Excessive redness over bony prominences may require the PSRD to be modified. Some redness or sock marks in the skin are normal in pressure tolerant areas, i.e. patella tendon or along either side of the tibial crest.